Shazam audition tapes could tease the movie’s villain. Yet another member of the Marvel family has been confirmed for Infinity War and Avengers 4. The Joker origin movie is close to taking a big step forward. Plus, new looks at the returns of Gotham and The Walking Dead and new footage from Zoo’s season finale. Spoilers now! Gal Gadot is in talks to join Bradley Cooper in Max Landis’s Deeper, about a former astronaut exploring a newly-discovered oceanic trench believed to be the deepest point on Earth, only to find a mysterious force hidden in the depths. 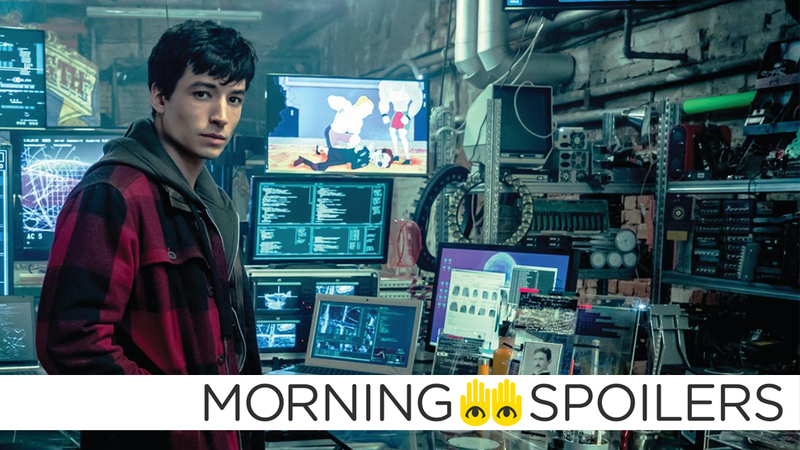 That same Deadline report for Deeper also includes an interesting line for the Flash movie: it offhandedly mentions that Gal Gadot is set to reprise her role as Wonder Woman in Wonder Woman 2, Justice League... and “and the spinoff for The Flash,” bolstering the previous rumor of Diana’s presence in the movie considerably. Meanwhile, Benedict Cumberbatch spoke to Digital Spy about the intensity of Infinity War. It’s ten years coming. It’s just a huge, huge, huge amount of work, huge amount of storylines and it’s all sort of pointing to this confrontation….It’s amazing to part of it even though I’m late to the party, it’s very cool one to be part of it. Matthew Vaughn spoke to Cinema Blend about his high hopes for the franchise. Variety’s Justin Kroll reports the solo Joker script will be turned in “next week”. Omega Underground has discovered audition tapes for the role of Billy Batson, and another featuring Arrow’s Parker Young auditioning for Shazam himself. One of the audition videos, since scrubbed from the web, hints that the Seven Deadly Sins—seven demons representing the classic sins that Shazam has faced several times in the comics—could be appearing as villains in the film..
Coming Soon has the latest IMAX poster. Here’s a new international trailer, with a little extra new footage compared to the trailer released yesterday. Speaking with Screen Rant, Nick Antosca revealed season three would not be a direct adaptation of a single Creepypasta story, but instead draw from several. Season three will also have a distinct Dario Argento vibe, “with a little Bernard Rose Candyman thrown in”. I will say there are a couple of working titles out there, and various guesses as to which stories we are drawing from, and some of those guesses are closer than others. I will also say that the third installment, which we just finished shooting and we’re about to go into editing is, as with the other seasons, very different from the first two. I would say Candle Cove is Stephen King, No-End House is John Carpenter, the third installment is Argento with a little Bernard Rose Candyman thrown in. And it’s also less of a direct adaptation of one creepypasta than the first two seasons are. It’s more like we took a story that we loved and we took one element of it in particular and expanded it greatly. With the encouragement of Max, Leroy romantically pursues a female cop (guest star Megalyn Echikunwoke), while they work on-site at a local resort. As the pair search for the culprit behind a string of murders, Captain Lafrey has Annie and Barry investigate her daughter (guest star Lauren Lindsey Donzis), who may be sneaking behind her back with a boy. Caitlin and Eclipse go on a quest to save Blink in the synopsis for episode two, “rX.”. After exerting her powers beyond their limits, Blink (Jamie Chung, “Big Hero 6,” “The Hangover Part II”) goes into a state of shock, forcing Caitlin (Amy Acker, “Person of Interest”) and Eclipse (Sean Teale, “Survivor”) to go on a mission to find a special serum that will help her to recover. Meanwhile, Reed (Stephen Moyer, “True Blood,” SHOTS FIRED) faces some difficult choices when it comes to helping his family, and Polaris (Emma Dumont, “Bunheads,” “Aquarius”) runs into some trouble. Coming Soon also has a gallery of character portraits. Head over there for more. Entertainment Weekly also has new pics from season eight of The Walking Dead. More at the link. Finally, here’s a sneak peek at tonight’s explosive season finale of Zoo.